Paul Krugman looks back on the past twenty years of macroeconomic policy and finds that his 1998 paper was more prescient than he or anyone could have imagined. Back then many observers assumed that central bankers--particularly those at the Bank of Japan--need only increase the monetary base to increase the price level. It was that simple. No one should seriously believe that the BOJ would face any significant technical problems in inflating if it puts it mind to the matter, liquidity trap or no. For example, one can feel quite confident that if the BOJ were to issue a 25 percent increase in the current supply and use it to buy back 4 percent of government nominal debt, inflationary expectations would rise. He goes to note that the public should, in fact, expect large expansions of the monetary base to be temporary. Otherwise, it would imply an implausibly large jump in the price level that would not be politically tolerated. For example, if the several-hundred percent increase in the U.S. monetary base expansion under the Fed's QE were expected to be permanent then the price level would have proportionally jumped several hundred percent as well. Krugman notes that the actual performance of Japan's first QE program of 2001-2006 and the Fed's QE programs bore out his predictions. These large-scale asset purchase programs ultimately proved to be temporary monetary programs. This is an important point and one that I stress in my own work. 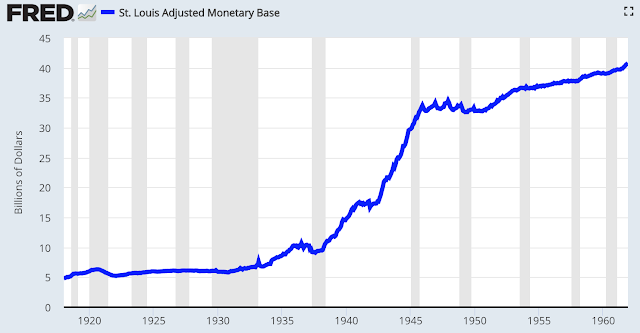 Just to be clear, permanent means an exogenous increase in the monetary base that (1) is beyond that required to accommodate normal money demand growth and (2) is not expected to be reversed. To illustrate this point, I want to repeat what I showed in an earlier post. There I used the Fed's median forecast of its assets through 2025 from its 2016 SOMA Annual Report to create projections of the Fed's balance sheet. These projections show the trend growth path of currency and a series I call the 'permanent monetary base' extrapolated to 2025. The latter series is the monetary base minus excess reserves. These two measures, which reflect the liability side of the Fed's balance sheet, are plotted along side the forecasted path of the asset side of the Fed's balance sheet. Note that the Fed's median forecast of its assets eventually converges with the trend growth of currency which historically has made up most of the monetary base. Consequently, the permanent measure of the monetary base roughly tracks currency's trend path. The figure implies the Fed's balance sheet forecast confirms the temporary nature of the monetary expansion under the QE programs. That is, the Fed expects most of the permanent growth in the monetary base in 2025 to have come from the normal currency demand growth. 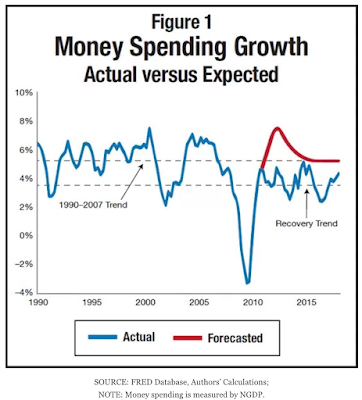 This endogenous money growth would have happened in the absence of QE. There is no sign of an exogenous permanent increase in the monetary base. 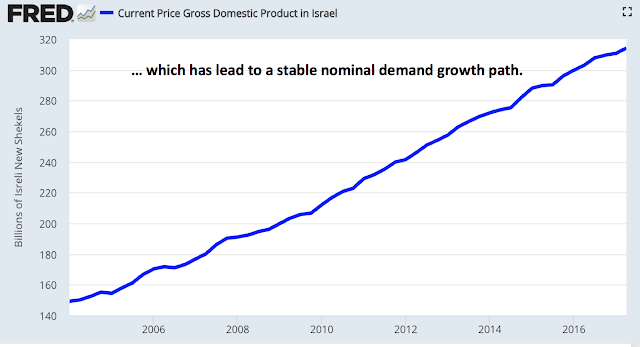 Krugman's bigger point is that to have robustly raised nominal demand over the past decade required a permanent increase in the monetary base. This did not happen at the Fed or the ECB. Krugman thinks it sort of happened in Japan under Abenomics. Maybe so, but I am not completely convinced. In my view, the shackles of inflation targeting made such permanent increases very hard to do at most advanced-economy central banks over the past decade. Given the way experience has undermined much of the original case for a 2 percent inflation target, and given the severity of the economic crisis, you might therefore have expected some revision – a rise in the inflation target, or a shift to some other kind of targeting – price level or nominal GDP targeting. But that hasn’t happened... This is quite remarkable. If the worst economic crisis since the 1930s, one that cumulatively cost advanced nations something on the order of 20 percent of GDP in foregone output, wasn’t enough to provoke a monetary regime change, it’s hard to imagine what will. His pessimism is understandable. However, I am more hopeful as noted in my last post. We are making progress. We have changed the conversation and that is the first step forward. Jay Powell went to Capitol Hill today for his first congressional testimony as Fed Chair. In addition, he submitted the Federal Reserve's annual Monetary Policy Report to Congress. A lot of ground was covered in his testimony, follow-up questions, and in the report. Here, I want to highlight one very interesting and potentially significant part of his testimony. 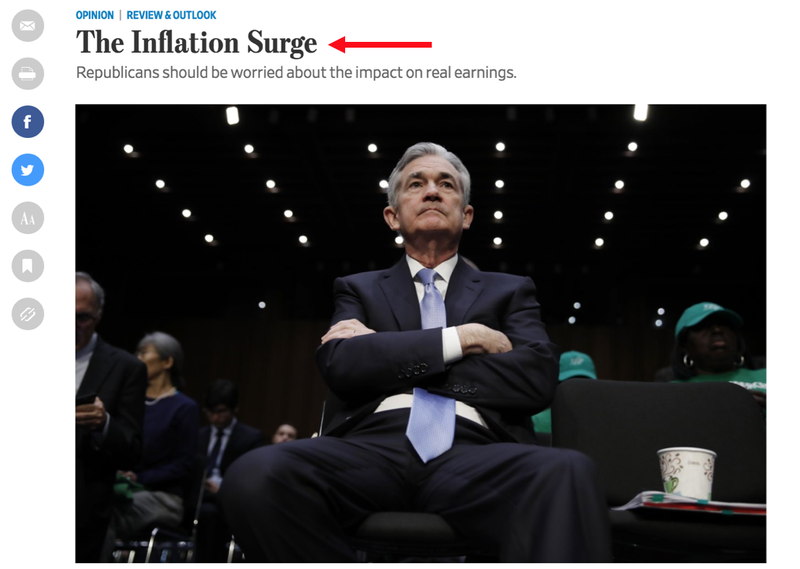 And that is Jay Powell's endorsement of monetary policy rules. I believe this is the strongest embrace of monetary policy rules to date by any Fed chair. This is progress in my view. But it gets even better. The monetary policy report that Jay referenced lays out a number of monetary policy rules, including a price level target rule. That is a huge departure from past practice when most rule discussions were stated in terms of some Taylor rule. For example, last year's Monetary Policy Report did not have a price level target in it. 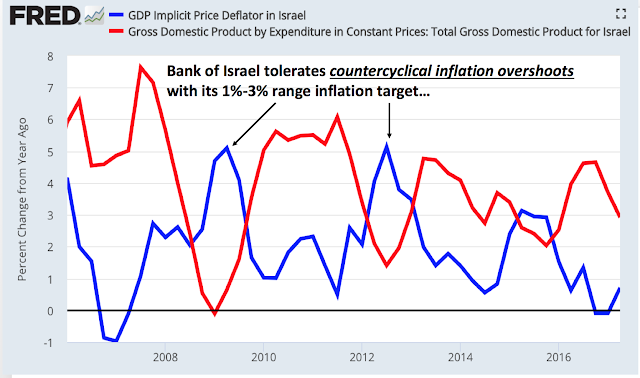 This discussion of an inflation target range and a price level target is interesting. It reinforces the view that the expanded rules list from the Monetary Policy Report is signaling a new openness to change. And just to be clear, an inflation target range properly done comes pretty close to what a NGDPLT looks like as noted in my previous post for the case of Israel. 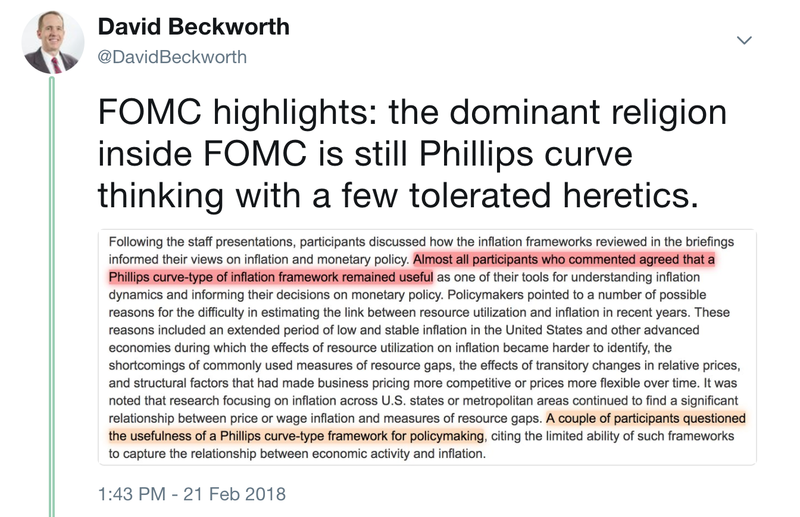 So all of the public conversations about a new monetary policy framework seem to be gaining traction at the Fed. Of course, the one rule that was not on the list in the 2018 Monetary Policy Report was a NGDPLT. As I have argued elsewhere, there are good reasons to want it over a price level target. But the fact that the Fed is having this discussion and has added a price level target to its menu of rules is major progress. So kudos to the new Fed chair and the FOMC for engaging in this conversation. Keep it going. Update: It has been brought to my attention that the price-level target noted above is in practice fairly close to a NGDPLT. This is because the price-level target has the unemployment gap in it. This observation is similar to Michael Woodford's noting that his theory-based call for an output gap-adjusted price level target in practice is roughly the same as doing a NGDPLT. Fair point. I should have noted it, but failed to do so. My preference, however, is still for a straight-up NGDPLT for two reasons. First, there is a significant knowledge problem surrounding estimates of the output gap as laid out in this article. (For a less technical discussion making the same point see this policy paper.) Second, I approach NGDPLT more from a velocity-adjusted money perspective rather than from an output gap-adjusted price level perspective. That is, I look at NGDP from the MV side of the equation rather than the PY side. Consequently, I see unobserved changes in potential output as a feature not bug of NGDPLT. With that said, I am super excited that the Fed has effectively put a NGDPLT target on its rule list. P.S. Maybe if Jay Powell and the rest of the FOMC started each day with a coffee mug like this, we might see NGDPLT on the list. We need to get some over to the Eccles building. 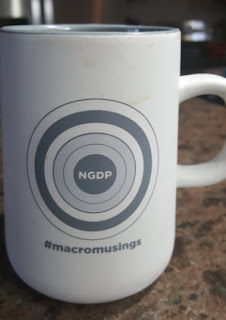 Reach out to us FOMC if you are interested in a mug and a conversation on NGDPLT. 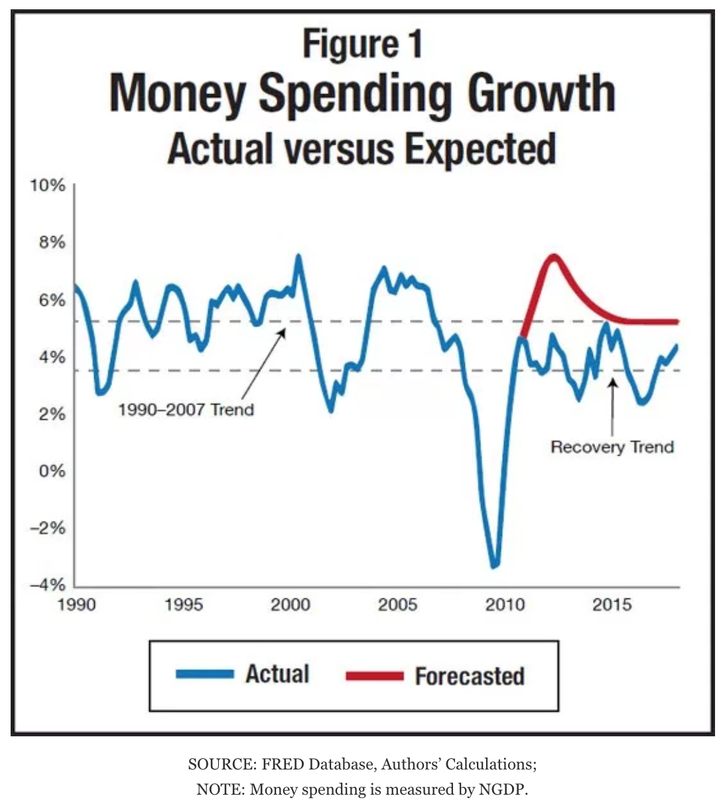 The economy seems largely to have adjusted to the new, lower pace of spending growth. The problem now is not that monetary policy is erring on the side of tightness and thus holding back the economy’s potential. It’s that the Fed’s apparent bias against letting spending and inflation drift higher, even temporarily, makes it more likely that the next economic downturn will again be severe and the next recovery will again be sluggish. 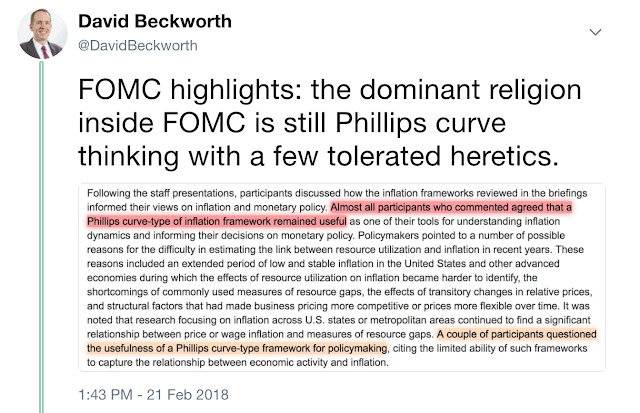 The January FOMC minutes came out this week and I had a few things to say about them on twitter. Below is a screen shot of my first tweet. I also did a quick write up of these points at The Bridge. 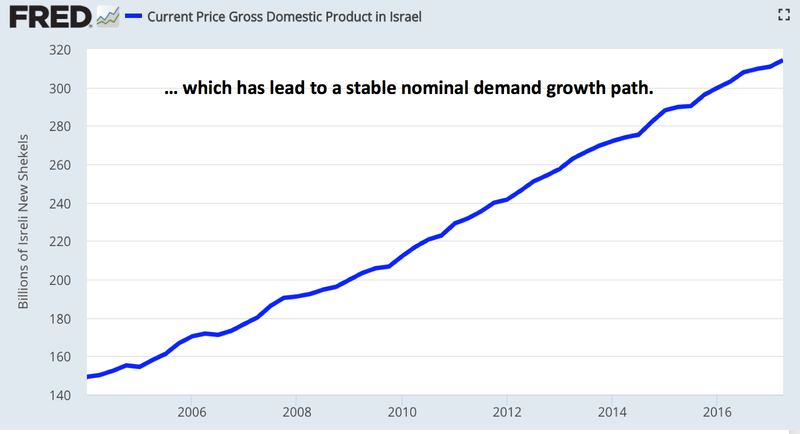 Consider first Israel's inflation rate, as measured by the GDP deflator. Since 2007, this inflation rate has moved in a countercyclical fashion. The BoI officially targets inflation within a range of 1%-3%, but has allowed inflation to touch 5% two times over the past decade when real GDP decline. It also has allowed inflation to fall when GDP has soared. Over this sample period, the GDP deflator inflation rate has average just over 2%. Imagine that: a symmetric inflation target over the business cycle! As a result of this inflation flexibility, nominal demand has been relatively stable. Well done BoI. Here's hoping that some at the Fed are taking notice. This week on the podcast I interviewed George Selgin. We discussed the difference between a corridor and floor system and what that means for the Fed. Among other things, we discuss how a floor system can create a liquidity-trap like situation above the ZLB, what a car in neutral can tell us about a floor system, and what we know about the legality of IOER. Take a listen.